Henrik Jonströmer is Deputy Head of Strategic Research in the Department for International Trade (DIT). Who takes part in trade? What is traded? What helps trade happen? The forces that shape international trade are in a constant state of flux. Blockchain technology, changing social attitudes to ownership, and the rise of China will all have significant impacts on which countries and firms participate in trade, what products are traded, and how trade takes place. To understand these forces and how they are likely to shape the future of trade, we have studied the key drivers of trade and what opportunities and risks these raise for UK trade. This is part of a broader project at the Department for International Trade that aims to understand how the future of trade might look like 20 years from now. Through a series of workshops with policy experts and analysts from both inside and outside DIT, we have identified the key drivers underpinning trade that have a high impact on UK interests. The drivers identified range from automation to the changing expectations of consumers and from the rise of a multipolar world-order to the economic power shift towards Asia. 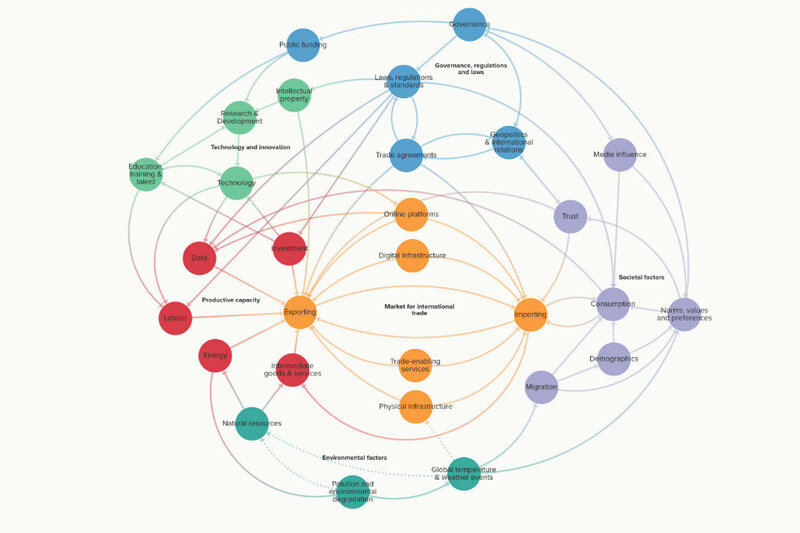 Following our driver mapping exercise, we used a systems approach to visually map out the factors that influence trade and their interdependencies. 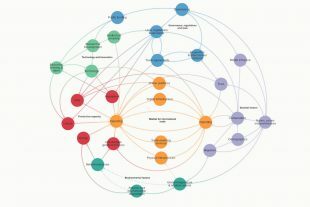 The global trade system map that resulted from this work is shown below. As the global trade system map shows, economic, technological and governance factors are all essential for trade. However, these are also inter-linked with factors not normally considered when analysing trade. For example, norms and values influence what products are in demand and thus produced domestically or imported. Environmental factors impact on the physical infrastructure used for trade and also drive changes in migration, demographics, consumption and imports. The insights gained during the driver and trade system mapping have furthered our knowledge base and produced a jumping-off point for the Department' for International Trade’s horizon scanning and policy research projects. This project has been a good way to engage policy and analysis teams in the Department. It has helped to broaden colleagues’ (and our own!) understanding of what makes up trade beyond purely economic factors, and equipped the Department to take a more holistic view when exploring how the future of trade might look like 20 years from now. Please comment if you agree or disagree with our findings about what we think will shape the future of trade. If you would like to know more about the Strategic Research Team in the Department for International Trade, please contact the author at henrik.jonstromer@trade.gov.uk.